Poet Will Schutt won the prestigious 2012 Yale Series of Younger Poets competition, the longest-running poetry prize in the United States. 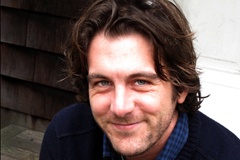 The competition’s judge, prize-winning and critically acclaimed poet Carl Phillips, chose Schutt’s manuscript, Westerly, for the award. Yale University Press will publish Westerly in April 2013. Schutt’s poems and translations appear in Agni, FIELD, Harvard Review, The Southern Review, and elsewhere. He has also received awards from the Academy of American Poets, the Stadler Center for Poetry, and the James Merrill House. He holds a B.A. from Oberlin College and lives in Wainscott, New York. Awarded since 1919, the Yale Series of Younger Poets celebrates the most prominent new American poets by bringing the work of these artists to the attention of the larger public. Earlier winners of the prize include Adrienne Rich, John Ashbery, and Robert Hass.